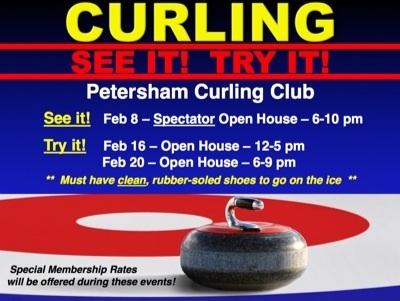 Reminder: Curling Open House TONIGHT In Petersham, MA – Try It Out! Want to try out the sport of curling TODAY? As we mentioned earlier, the Petersham Curling Club is having an Open House free to anyone TONIGHT, Thursday, February 20, from 6-9 pm. Over 280 people attended last Sunday’s Open House and the PCC has posted some great photos online. The Petersham Curling Club (PCC) is about 45 minutes south of Keene. Just head south on Route 32 (going down past the Keene airport) and stay on Route 32 all the way down through Richmond, NH, Royalston, MA, Athol and on into Petersham. The club is located right off of Route 32. More information can be found on the PCC directions page. In good weather it takes about 45 minutes to get from Keene down to the Petersham club. At tonight’s Open House, you’ll learn how to deliver a stone, the role of sweeping and more. This will be a great opportunity to get on the ice and experience the sport yourself. All you need to bring is a pair of clean, rubber-soled shoes and your enthusiasm! The Petersham Curling Club is a great place to curl and is where several of us involved with starting up the Monadnock Curling Club all curl. We strongly encourage you to head down to Petersham, MA, and check out the Open Houses. And if the curling bug bites you as it has us, please do join the PCC and start playing the awesome sport of curling! This is where you can get started today and enjoy curling! And then… please let us know you are interested in seeing curling come to Keene! This entry was posted in Events on February 20, 2014 by Dan York.